Club Fonograma Archive: C. Tangana - "Trouble + Presidente"
Among the most exciting things in hip-hop in 2013 was seeing how established rappers started working with forward-thinking and off-kilter electronic producers. Kanye teaming up with the likes of Arca and TNGHT, Danny Brown with Rustie and Darq E Freaker (even R&B threw some curveballs in there as Kelela worked with Jam City, among others). We’ve been wondering when we would finally see a similar dream collabo like that happening in our own niche, which is why last year we were already calling for rap collective Agorazein to team up with Barcelonan maximal electronica producer Alizzz. And luckily enough it didn't take long to happen. 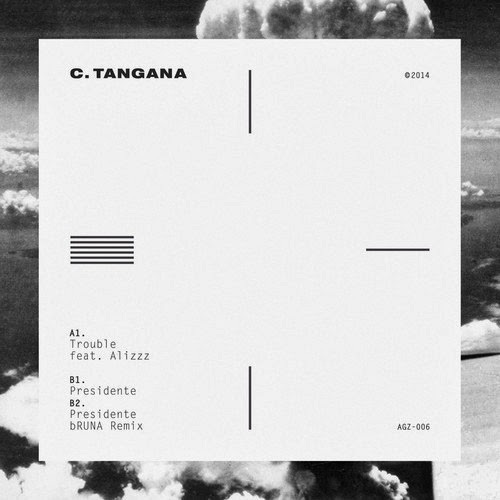 Agorazein founding member and suave rapper C. Tangana’s new single sees him join forces precisely with Alizzz in the single’s A-side “Trouble.” The song initially flashes what the common elements between both artists are: the yacht rap piano intro and outro, the overall paradisiac sentiment of the production. But both musicians also make the most of the occasion to showcase their own qualities as well. The first half is Alizzz’s show, finally confirming he can thrive as a hip-hop producer with a downtempo beat that steadily builds-up and sets the scene for C. Tangana to take the spotlight. The MC eventually breaks loose near the 2-minute mark, and amazingly manages to sound both piercing and laid-back, while emanating his trademark aura of effortlessness on the mic. “Trouble” comes to confirm what we were already starting to sense in Whoa!, which is precisely how much Alizzz’s tracks are on a whole other level when he decides to share the spotlight (cf. “Champagne” ft. Kongo Lacosta). B-side “Presidente” exposes C. Tangana’s more dancefloor oriented sensibilities and goes for more aggro (yet always trill) rhymes. It also and includes a remix from yet another Barcelonan producer bRUNA whose 2013 release THENCE had signs that he could also be successful collaborating with rappers. Oh and if this wasn’t awesome enough already, Alizzz also just dropped his new EP Sunshine on Mad Decent.